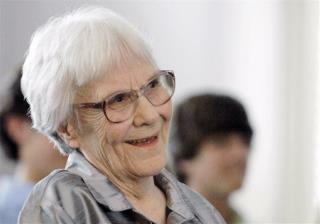 (Newser) – Harper Lee has been depicted as alternately obstinate, humiliated, and "happy as hell" since HarperCollins announced her second novel would be published—and now more red flags have popped up. Amid the debate over her mental competence, the state of Alabama has jumped into the fray to investigate at least one claim of elder abuse involving the author and whether she was able to authorize the release of Go Set a Watchman, the New York Times reports. So far, officials from the state's Department of Human Resources, aided by fraud watchdog Alabama Securities Commission, have interviewed several of Lee's friends and acquaintances, workers at her assisted-living home, and Lee herself, an unnamed source tells the Times. It's a shame. No one deserves to be treated that way. I'd love to read her book. She wrote it before To Kill A Mockingbird. It involves the characters from that book. So Ms. Lee; I guess it IS a good thing you are back in the spotlight ?!? Next time, don't be so quick to slam those who keep you relevant ! ! ! If you are not her, Michael Jackson or Elvis Presley your identical situation will never be scrutinized but better one than none. She is in a nursing home! Despite the anecdotes bloggers will dredge up, no one puts themselves in a nursing home ever! The homes exist for, and pitch their ads to, those who want to lock away old people they do not love enough to care for; and who want to steal their assets. Nursing homes are for profit businesses: if you pull the purse strings then YOU are the one they will respect and obey! What is the condition that justifies putting her there and how is it we all think it is ok to do this to old people without any kind of due process whatsoever. There is no law that empowers relatives or doctors to do this to free Americans without court proceedings yet the practice is ubiquitous and unchallenged! Nursing homes are not humane; they are not nice; they are not home. Those in nursing homes have no privacy; no independence; cannot brew their own coffee; nor select the TV station on in the day room; decide the menu; and are at the mercy of uniformed strangers who harken to their call only in the imagination and rationalizations of those not living there! Those in nursing homes find themselves with neighbors who keep dying and getting replaced. She is in a nursing home: she MAY be lucid but she is NOT in control! If she is lucid, what, without speculation, is the reason she is there! The imprisonment of elderly persons is one of society's nastiest dirty secrets. If you have assets and "loved ones" then make haste to figure out some way to protect yourself and do not underestimate the difficulty of the problem because no one is listening and no one cares. Persons in nursing homes cease to exist. If she can authorize the release of a book then why can she not pick herself up and leave on her own says so! Because she no longer has any place else to go!